Panasonic decides to throw in the towel on the cool retro design scheme, this time around fronting a DSLR that may actually sell. 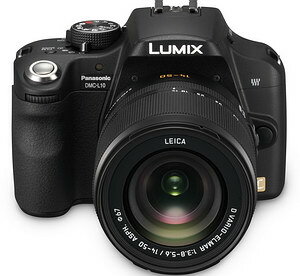 Check out the new Panasonic DMC-L10. It looks to be a lot like a fixed lens camera, only you can change the lens for more versatility, and of course better image quality-I would venture to guess. It's pricey ($1299) for the features, at least on paper. Look below for more details. 2.5" swing out! LCD with 207,000 pixels. Includes lens, 14-50mm F/3.8-5.6 IS, not the same as the DMC-L1 came with, this is a cheaper version, watch for the term ELMAR-cheap" instead of ELMARIT-expensive. Face detection, I can do this on all my cameras. Shoots RAW at 3fps up to 3, and unlimited JPEG. Dust reduction like Olympus cameras. Image stabilization is on the lens, not in camera. Digital zoom, just like featured on a fixed lens camera, in fact it looks to be a lot like a fixed lens camera only with -presumably- better image quality. "Live view" mode is very similar to a Fixed lens camera in operation. All lens reviews (except Nikon) have now been updated using the 10.2mp Sony A100, the 6.1mp Konica Minolta 5D will be shelved. All new product shots, including box contents in the US market. Sharp center photo comparisons, and photos to back up my results on distortion. All macro images have been re-shot with the Sony A100, except for the Nikon reviews. Nikon reviews will be basically the same, as in shot with the 6.1mp D40. Keep that in mind when comparing. After I got to looking at my older product photos, I was pretty amazed at how crappy poor they were. That's one of my reasons for working over the original reviews. I also though I might use more images to back up my results, making the review more meaningful and useful. I have five more lens reviews coming up, I'll start it off with the repaired Sigma DC 18-50mm F/2.8 EX macro, which I hope to have ready in a week. Then (not necessarily in the following order) I have the Sony 24-105mm F/3.5-4.5 zoom, plus the two Sony re-branded models; the 18-200mm and the 11-18mm. Don't forget the Sigma 10-20mm wide angle that I'll compare with the Sony 11-18mm. They'll be ready in September. Nikon finally intoduces their two newest big guns, a full frame D3, and the D300. Check out the D3 immediately below, then the D300. Look at larger pictures of the two cameras here. 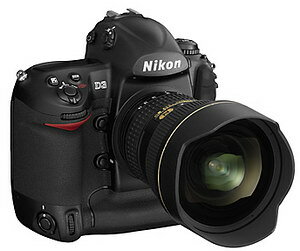 In addition to being a very handsome camera, check out the specs for the new Nikon D3. 3.0" LCD with a staggering 920,000 pixels!!! Full frame sensor, 23.9x36mm FX format. Can use DX lenses, camera automatically adjusts. ISO 200-6400 or boost to 100-25600. 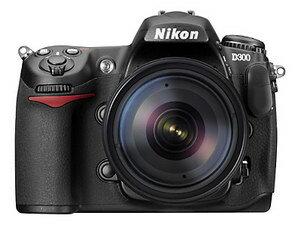 The Nikon D300 gets some nice upgrades, many are the same as the D3 above. ISO 200-3200, boost to 100-6400. 3.0" LCD, 920,000 pixels, same as the D3. Fast burst rate at 6fps up to 100 images in the Large/normal setting, up to 8fps with the optional battery grip. Weather sealing, like the D200. HDMI port for HD viewing. $1799 US, on sale 11-07. Also, Nikon introduces five new lenses, a 14-24mm F/2.8, 24-70mm F/2.8, 400mm F/2.8 VR, 500mm F/4 VR, and finally, the 600mm F/4 VR. Last, but not least, Olympus spews releases eight new cameras, including the upgrade to the SP-550, the SP-560! Really! Is that for real? They've added an 8mp sensor and some processing gimmicks. Oh, and the new 18x zoom range is 27-486mm, I guess they're using a larger sensor, 1/2.35? Sound familiar? Like Fuji? Sorry, no photos or specs yet. Canon ready to dump 8 new cameras on the market. Go here for nice product photos and a short description. I'll post spec sheets in a couple of days. I find two to be of interest, the 40D and G9, unfortunately, I probably won't be reviewing either one. Somehow, the G9 and A-series downgrades are resisting the wide angle trend, like starting at 28mm instead of 35mm or 36mm. Maybe I'm one of the few that really enjoys wide angle. Important news for Sony lovers; Sony announces a new 12.47 CMOS APS-C sized sensor, capturing 10fps, most likely aimed at a new Sony DSLR. I'm not sure whether it'll be for an entry level camera, or a Mid-grade to take on the Canon 40D. Sony has fronted an mid-grade, semi-professional type DSLR, plus what looks to be a full frame or non-APS-C type DSLR last march at the PMA show in Las Vegas. I suspect an announcement will come before the end of the year. Keep in mind Sony was the first to come out with a budget 10mp DSLR. Good news from the repair shop on the Sigma 18-50mm F/2.8 I just bought. It appears they have fixed it, and now it's usable! I had to pay shipping, go figure. So I have to re-do my entire review I had nearly ready. Oh well, it was only a weeks worth of work. I also have the Sony 11-18mm and 18-200mm copies I'll be reviewing shortly, I'll do a new and completely separate review for each, not just a quick product shot change of the Konica Minolta lens reviews. Next month I'll be reviewing the Sony 24-105mm F/3.5-4.5 zoom, plus I'll do a review and comparison of the Sigma 10-20mm to the Sony 11-18mm lens. I'm also trying to fix the slow load time on the FX100 sample shot page. 8/11/07 Updated: Added nine full resolution shots, hit the link below. I've finished the sneak peak review of the Panasonic Lumix DMC-FX100 12.2mp compact camera. I added quite a bit of information and photos since the last update on 8/9/07, so if you haven't visited lately, you might want to check it out again. I added my overall take on the camera at the top of the page. I also got a little carried away with this review page, it's way too big! For all the dial-up people--please be patient! Sometime in the next few weeks I'll put it in the more familiar review format, but you really have everything you should need to make a buying decision. I'm still working on the sample shot page, that'll be made available in a couple of days. Also, let me know if you'd like to see a review of the Panasonic Lumix DMC-FZ18 superzoom, in which case I'll compare it directly to the Olympus SP-550 UZ. I may have a chance to get one soon, if there's enough interest. I've got a good jump on the 12.2mp Panasonic Lumix DMC-FX100 pre-review. Go ahead and check out what I've come up with so far. I posted some sample ISO crops, then downsized them to match other cameras that are less than the 12.2mp of this one. The results are a little surprising. Resolution is very good at the wide end, but much less so at telephoto. Hit the link above for more observations. I'll be adding new information every few days so check back often.